Manicured nails is the main component of beautiful pens. A tastefully decorated, neat manicure is a fashion decoration. With the help of sequins to give your fingers a refinement, the exotic and festive look. To evenly apply glitter on your nails, you'll need a certain skill. If you are willing to experiment, just get a nail Polish with glitter in ready mixed form and cover his nails. You can own add dry sparkling grains of sand in transparent varnish, mix well and shining finish. However, professionals do the sequined patterns on the nails using a special gel Polish. 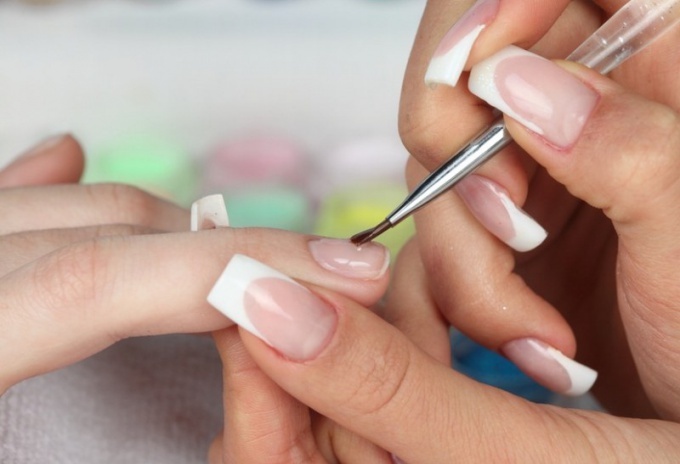 Prepare your nails, cut the cuticles and give them the desired shape before you create a manicure. Apply on the whole nail a thin layer of bonder gel (acid free gel primer for capacity and modeling of nails). After treatment the surface becomes slightly opaque. If left damp smudges, remove the excess gel with a sponge. Wait until dry basis. Without removing the sticky layer, now apply a clear gel to the entire surface of the nail plate. Take cover carefully: if product gets on the cuticle, the nail will loosen. Nails sequins coat the most convenient way for you: either mix them with the gel before applying or sprinkle them on the nail plate to the drying of the gel layer. For the method of osypanie sequins, use a regular eyeshadow applicator, a thin brush or a pointed tube of cocktail. To remove excess, just shake hands. In any case, after drying bases with glitter to cover the nail plate with a layer of glossy lacquer to secure the result. Manicure is ready. If you are using as the basis for nail Polish gel, you can sprinkle sequins the entire surface of the nail, and only the tips of the drawn figure, or a specific pattern, which adds originality. To reduce the flow of sequin, purchase them a separate brush – this is to prevent the grains in the gel and will eliminate the need to clean the brush.